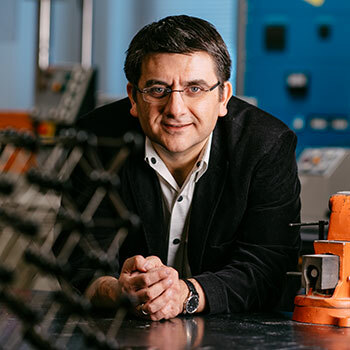 A technical look at how materials science professor Cem Tasan is working on novel metals and materials for the future. If humans are going to be able to travel to Mars one day, Cem Tasan’s research on metals just might play a role in the mission. Tasan, the Thomas B. King Career Development Professor in Metallurgy in the Department of Materials Science and Engineering at MIT, works to produce metals that will bend with the changing times. One of the areas Tasan’s lab focuses on is the self-healing of metals—the idea that, under the right conditions, metal containing microscopic cracks can actually pull itself back together. Tasan and his students conduct what are called bulge tests, where thin sheets of metal are clamped and pressure is applied from the bottom so that the metal bulges. The metal is then looked at under a microscope to understand how well it performs damage-resistance. The idea of reusing and repairing metal is one of personal importance to Tasan. He reflects on his own life and notices, “that more and more, we lose this capability to reuse things. I know from my own family that my father is much more capable of repairing things than myself. And I know from his stories that his father was.” In a time when waste is so prevalent worldwide, the ability to reuse metals is, as Tasan says, both feasible and logical.